English: xkcd webcomic 285 entitled "Wikipedian Protestor". Note that this image was originally meant to be displayed with the tooltip "SEMI-PROTECT THE CONSTITUTION". Čeština: 285. díl webového komiksu xkcd nazvaný „Demonstrant wikipedista“. Původně byla u obrázku vyskakovací bublina s textem „POLO-ZAMKNĚTE ÚSTAVU“. Deutsch: xkcd Webcomic 285 mit dem Titel “Wikipedian Protestors”. Im Original wurde das Bild mit dem Tooltip „Halbsperrung für die Verfassung“ dargestellt. Español: Webcomic 285 de xkcd titulado "Wikipedian protestor". فارسی: وب‌کمیک ۲۸۵ ایکس‌کی‌سی‌دی با عنوان «معترض ویکی‌پدیایی». Filipino: Ika-285 na webkomik ng xkcd na pinangalang "Nagpoprotestang Wikipedista". I-nota na ang imaheng ito ay nilagay kasama ang tooltip na "I-SEMI-PROTEKTA ANG KONSTITUSYON". 한국어: xkcd 웹툰의 285번째인 "Wikipedian Protestor"입니다. Polski: 285. odcinek komiksu internetowego xkcd zatytuowany "Protestujący wikipedysta". Początkowo obrazek miał zawierać tekst "CZĘŚCIOWO ZABEZPIECZYĆ KONSTYTUCJĘ". Português: Número 285 da webcomic xkcd, entitulada “Manifestante wikipedista”. Note que a imagem, em seu contexto original, é exibida com a dica de contexto “SEMIPROTEJA A CONSTITUIÇÃO”. Русский: 285-й выпуск вебкомикса xkcd, озаглавленный "Протестующий википедиец". В оригинале картинка снабжена всплывающей подсказкой "SEMI-PROTECT THE CONSTITUTION" (англ. "Полузащищайте Конституцию") — отсылка на известный американский речевой штамп "Protect the Constitution" (англ. "Защищайте Конституцию"). Пародия на распространённый в Википедии шаблон с запросом источника и практику частичной защиты страниц. Tagalog: Ika-285 na webkomik ng xkcd na pinangalang "Nagpoprotestang Wikipedista". I-nota na ang imaheng ito ay nilagay kasama ang tooltip na "I-SEMI-PROTEKTA ANG KONSTITUSYON". עברית: xkcd ובקומיקס 285 "ויקיפד מפגין"
Wikimedia has received an e-mail confirming that the copyright holder has approved publication under the terms mentioned on this page. This correspondence has been reviewed by an OTRS member and stored in our permission archive. The correspondence is available to trusted volunteers as ticket #2007071410011749. English: All the xkcd webcomics are under the CC-NC-BY-2.5 license — which is not considered to be a free license on Wikimedia Commons. However, the author, Randall Munroe (en:User:Xkcd), released this specific image under CC-BY-2.5 so that it can be used on Wikipedia. See this page and the revision history for details. Čeština: Komiks je parodií na rozšířenou šablonu „Citation needed“ na anglické Wikipedii. (Ekvivalentem na české Wikipedii je šablona „Doplňte zdroj“.) Zpráva naznačuje, že by politici měli dokládat zdroje svých tvrzení (a přestat lhát), stejně jako se o to snaží Wikipedie. Deutsch: Der Comic ist eine Parodie auf die in der Englischen Wikipedia weitverbreitete Vorlage Citation needed (Zitat/Quelle benötigt) . Die Aussage ist, dass Politiker besser auch ihre Quellen nennen sollten (anstatt zu lügen), genauso wie Wikipedia es versucht. English: The comic is a parody of the wide-spread Citation needed template on the English Wikipedia. Its message is that politicians should state their sources (and stop telling lies), just like Wikipedia tries to. Español: El cómic es una parodia de la plantilla Citation needed, equivalente a la española es:Plantilla:Cita requerida. El mensaje es que los políticos deberían citar sus fuentes y dejar de contar mentiras, al igual que trata de hacer Wikipedia. Esperanto: Tiu ĉi bildo parodias la Vikipedian ŝablonon „citaĵo bezonata“. Français: Cette bande-dessinée est une parodie du modèle Citation needed (dont l'équivalent français est Référence nécessaire) largement répandu sur Wikipédia. Le message est que les politiciens devraient citer leurs sources (et arrêter de mentir), comme l'indique politique de Wikipédia. Polski: Obrazek jest parodią szablonu Fakt, szeroko stosowanego w Wikipedii. Jego przesłaniem jest że politycy winni podawać źródła swych twierdzeń (i przestać kłamać), tak jak Wikipedia próbuje to czynić. Português: Este quadrinho é uma paródia da predefinição Citation needed (equivalente à predefinição Carece de fontes, na Wikipédia lusófona) na Wikipédia anglófona. Sua mensagem é que políticos deveriam divulgar suas fontes (e pararem de mentir), assim como a Wikipédia tenta. Tagalog: Ang komik na ito ay isang parodya ng rumaraming padrong Citation needed sa Wikipediang Ingles. Ang mensahe nito ay dapat sinasabi ng mga politisyano ang kanilang mga pinagmulan (at huminto sa pagsasabi ng kasinungalingan), tulad ng sinusubukang gawin ng Wikipedia. Русский: Этот комикс — пародия на распространённый в Википедии шаблон источник?. 한국어: 이 만화는 널리 알려진 틀 출처를 이용한 패러디입니다. 이것이 담고있는 메시지는 정치인들은 그들이 말할 때 출처를 밝히라는 것(그리고 거짓말은 그만 하라는 것)입니다. 위키백과에서 하고 있는 것처럼 말이죠. 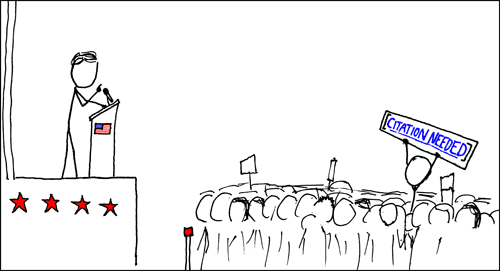 A single-panel cartoon showing an American political speech, with a protester holding up a "Citation Needed" banner.